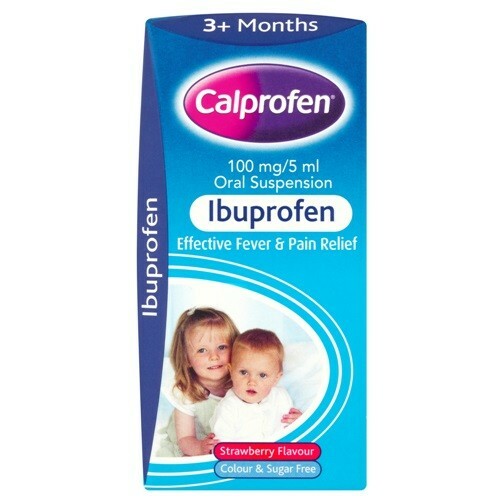 Calprofen is a strawberry flavoured Ibuprofen suspension for babies and children. It can be taken for the relief of pain from teething toothache earache headache backache minor muscular pain aches sprains and strains. Containing ibuprofen it also reduces temperature and fever in colds and influenza. Each 5ml spoonful contains 100mg ibuprofen. 6 to 12 months: One 2.5ml dose up to 3 times a day. 1 to 2 years: One 2.5ml dose 3 -4 times a day. 3 to 7 years One 5ml dose 3 to 4 times a day. 8-12years: 10ml 3-4 times a day. Doses should be given every 6 to 8 hours with a minimum of 4 hours between doses.